> My final trip of the year was a life long dream. I went down to southern Arizona with the dogs in tote. I went through New Mexico and saw my very first javelina on the side of the road. I put my trust in a GPS unit that sent me 2 hours in the wrong direction because it was supposed to be the “quickest” route. See it I ever put my trust in modern technology. I made it to my daughter’s house in Phoenix in just under 18 long exhaustive hours. 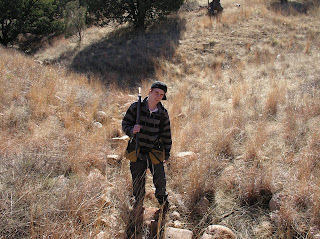 My 16 year old son, Dylan, and I were up early to meet a true quail bum (who chases birds almost 90 plus days a year…lucky sucker…in Tucson the next morning for our first day of Mearn’s quail hunting. Steve Henderson was a great guy and gracious host. 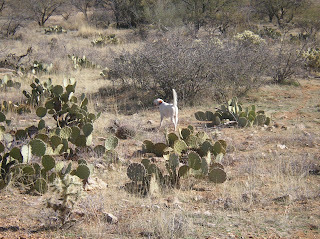 We met with him just east of Tucson, and we headed out to Mearn’s country. I fell in love with Mearn’s quail and the country they inhabit. This was one of the best years on record for these birds…they had a good carry over year and rain at the right time of the year. 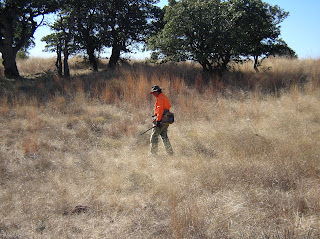 We moved an honest 11 coveys of quail that day. I seemed to always be in the right spot at the wrong time. 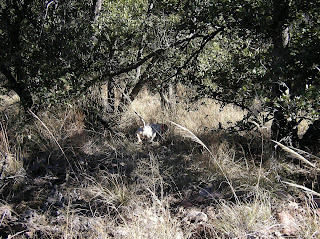 Mearn’s hunting reminds me of a combo of chukar hunting and ruffed grouse hunting. We heard more birds flush than we actually saw. These birds hold extremely well and they were made with pointing dogs in mind. 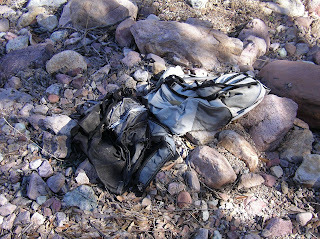 We saw evidence of several illegal immigrants crossing through the draws…they deposit their backpacks and trash…littering this beautiful country side. it’s a shame! We ended the day at Steve’s house with a wonderful steak dinner. That night Dylan developed the flu and was violently ill. There was a gem convention going on in Tucson and all the hotels were booked up for the weekend. I was able to find one room at a Holiday Inn at the lovely sum of $300 for one night! Of course I took it…but couldn’t help but feel gouged by them. 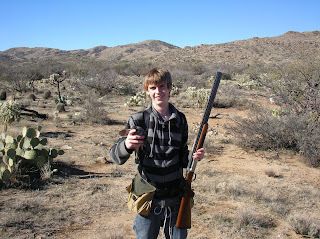 The next morning we meet back up with the quail bums for a Gambel’s quail hunt in the desert. The road getting out there was terrible…washed out and rutted. This was one of the worst Gambel’s year on record due to poor winter rains the previous year and over grazing. We did find a few coveys and I learned that these birds are TRUE track and field stars. Everything in Gambel’s country either sticks, stabs, gabs or grabs you and the dogs!!! I saw some of the very best display of English Setters worked on wild birds in my life!!! Those guys’ dogs were truly incredible! On line with what author Ben O. Williams declared in his Bird Dog book, wild birds and exposure is what makes a great bird dog! We ended the day early because it was 75 plus degrees to a wonderful tail gate barbecue…these guys know how to do it in absolute STYLE! Dylan and I headed back to Phoenix that night because of the flu! I spent the next day and a half with my daughter and her husband. I kept day dreaming of Mearn’s country and English Setters. I left for 30 degree Denver weather leaving the 80 plus degrees of Phoenix sun behind…I so wanted to turn around and head south for just one more covey rise! As I drove north towards home, I couldn’t help but reflect on the past 5 and 1/2 glorious months of bird dogs season…my Elhew Pointer, Gep, had pointed and retrieved over 11 species of game birds…It was a really good year and I made it home alive! I’ll be forever dreamin’ of Mearn’s Country and English Setters! Next Post >Tinnitus…For Whom the Bell Tolls!